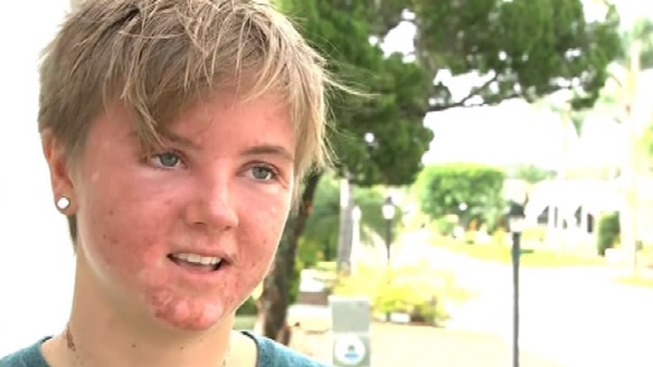 A 20-year-old college student was stranded in the ocean for 16 hours, and lived to tell about it. Even for the most experienced swimmer, it's a nightmare scenario. Stranded in the middle of the ocean with no food and the blistering sun burning down on your face. Jelly fish and sting rays circling beneath your feet. That’s what Heather Barnes had to deal with on Friday…for 16 hours. "I couldn't sleep," she wrote on her Facebook page. "So I went to collect coral samples." Barnes went out into the ocean around 4 a.m. That's when her trouble began. "I started to cramp up," she said. "I didn't really think it was a big deal at that point. I flipped over and tried to stretch out my leg." "About ten minutes later I realized how much farther I had been pulled out," she said. "There was no way I could swim against it at that point." Exhausted, sunburned and suffering from dehydration and jellyfish stings, Barnes began the agonizing journey back to land. "There were several times when I thought I wasn't going to make it," she said. "But even when you mentally decide that, your legs are still treading water and you realize you're still keeping yourself above water even when you thought you had given up. So you might as well tread in one direction. You might as well keep going. Even when I thought I had given up, my body hadn't." Meanwhile trip organizers and college officials were quickly realizing that she was nowhere to be found. Barnes’ mother, Jennifer Dukelow, remembers the phone call she received eight hours after her daughter went missing. Dukelow quickly notified her friends from work as well as her church. The community sprang into action, doing all they could to help save her daughter. The resort where Barnes was staying sent out fishermen, kayaks and hikers to help find her. Dukelow says her daughter not only received physical help, but spiritual aid as well. “We had prayer chains going out from all the bodies of the church,” she said. While friends and family turned to prayer, Barnes says there was one thing that helped keep her motivated as she swam back: food. "I didn't think about really serious stuff along the way," Barnes said. "I didn't think about my family that much because it seemed like so much responsibility to not only swim for myself but also swim for other people. So I thought about food a lot. I thought about all the food that I hadn't been able to eat on the island in three weeks." Finally, after 16 hours in the ocean, Barnes saw land. "When I first got on land I landed on Lion's Point, which was not part of the island I had come from," she said. "I saw a light flashing on me and two locals came out. They thought I was a shark." Barnes says the locals bathed her and gave her water. They then kayaked her back to the island where she was staying. Once she returned, she says she was immediately surrounded by a large group of people, overjoyed that she was still alive. "People were pouring out, carrying me, kissing me and holding me," Heather said. "It was crazy." Dukelow says she was overwhelmed with emotion when she found out her daughter was safe. Barnes is back in the U.S. and being evaluated by doctors. Dukelow says her daughter suffered bad sunburn but otherwise is doing okay. Barnes will be back in New Jersey on Friday to see her family.